Delegates from Lima 2019 and Rio 2016 amongst others participated in the programme. A group from the APC Toronto 2015 Observers’ Programme visiting Mississagua Sports Centre in Toronto. 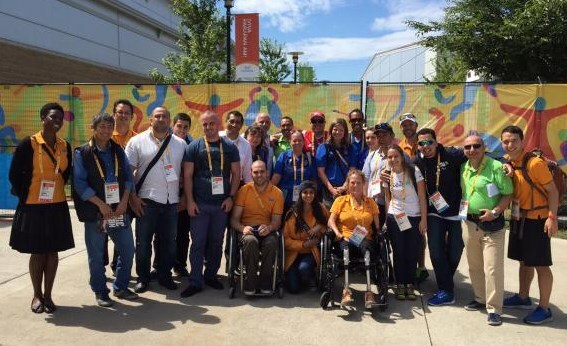 The second Americas Paralympic Committee (APC) Parapan American Games Observers’ Programme concluded in Toronto last week under the stewardship of the IPC Academy, the International Paralympic Committee’s (IPC) education division. Participants attending Toronto 2015 included delegates from Lima 2019, the hosts of the next Pan and Parapan American Games, as well as representatives from current and future para-sport event organisers such as Rio 2016, the Asian Paralympic Committee, UK Sport, Defisportif AderGo and the National Paralympic Committee of Georgia. The four-day long programme included thematic presentations from senior management staff of the Toronto 2015 Organising Committee on topics such as accessibility, integrated planning, sport and classification, Games services, marketing, communications and Parapan Am Games client experience. The observers visited a number of Parapan American Games competition venues, getting insights to facilities ranging from start-of-the-art inclusive facilities to refurbished venues where many interventions were required in order to meet IPC standards. Delegates also visited the dedicated Athletes Village.